The first African academic to get tenure in Cambridge has now become full professor at the University of Toronto. Prof Ato Quayson. Ato wrote on Nigerian literature for his PhD at Pembroke in 1995. 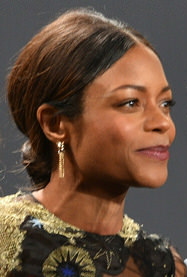 Naomie Harris OBE is an actress, who was born and raised in London. Her mother was originally from Jamaica and her father from Trinidad. Harris attended London St Marylebone School and later Woodhouse College. She graduated from Pembroke College in 1998 with a degree in Social and Political Sciences (currently, the HSPS Tripos). She later completed her training at the Bristol Old Vic Theatre School. Harris started her acting career as a child, appearing on the children’s television series Simon and the Witch in 1987. Her other acting roles include playing Tia Dalma in the second and third Pirates of the Caribbean films and Selena in 28 Days Later. In 2013, she played a leading role in the British-South African biopic directed by Justin Chadwick, Mandela: Long Walk to Freedom, as Winnie Mandela to Idris Elba’s protagonist role as Nelson Mandela. Winnie Madikizela-Mandela gave a positive appraisal of Harris’s performance, noting that on viewing the film she felt Harris wasn’t acting but channelling her, adding it was “the first time she felt truly captured on film”. Harris also played Eve Moneypenny in the James Bond films, Skyfall and Spectre. She was the first black actress to play Moneypenny’s part. More recently, she starred in the critically-acclaimed film Moonlight, for which she earned nominations for several awards including the Golden Globe, BAFTA and Academy Award for Best Supporting Actress. In the 2017 New Year Honours, Harris was appointed an OBE for services to drama. Haroun is a Cambridge undergraduate and researcher.